What is ERISA? And why should you care? to the employee. Insurance benefits are benefits just like vacation and paid holidays. When a third party doesn't appropriately settle claims, and the patient (employee) has to pay more for their healthcare, it is wrong. ERISA laws require third party administrators to settle claims fairly. After all, the claim doesn't belong to the doctor, the midwife, the birth center or the hospital; it belongs to the patient. We understand ERISA and require the insurance companies to comply with applicable laws in settling your claims. This is good news! If your insurance company tells you they will pay for a doctor's services, but not those of a midwife, could they be trying to influence your decision in a healthcare provider? We believe they are and the law agrees. ERISA stands for The Employee Retirement Income Security Act of 1974. It is federal law that applies to many private employers. The simplest way to understand ERISA is that it establishes minimum standards for health benefit plans to protect employees and employers. It does not require employers to offer plans, but sets important standards for employers who do. See links below to learn more about ERISA and what it requires of employers and those they hire to manage health claims. Complaints involving alleged violations of ERISA are handled by Benefit Advisors in our national and field offices. Those who file complaints with us can expect a prompt and courteous response from our staff. Every complaint received will be pursued and, if determined to be valid, resolution will be sought through informal dispute resolution. You can expect to receive a status report from the assigned benefits advisor every 30 days. If your valid complaint cannot be resolved informally, it may be referred for further review by our enforcement staff. While we cannot ensure that every complaint will result in an investigation, at the conclusion of enforcement activity, if requested, we will furnish an understandable explanation of the outcome of our review and investigation. For technical assistance and complaints, you should call EBSA's toll free number at 866-444-3272. 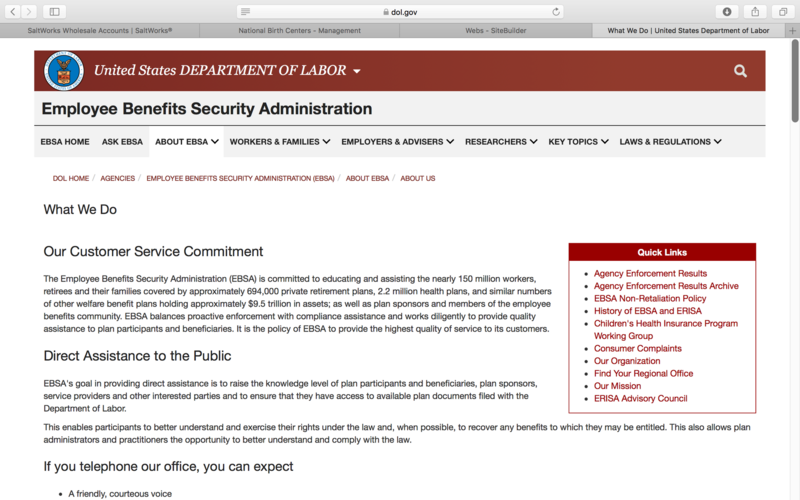 You may contact us electronically at www.askebsa.dol.gov. The Taxpayer Relief Act of 1997 eliminates the requirement of plans to file Summary Plan Descriptions (SPDs) and Summary of Material Modifications (SMMs) with EBSA. SPDs and SMMs filed with the agency before that date may be on file and are available upon request if they are maintained. If a plan participant or beneficiary wishes a more recent copy of the SPD or SMM, the agency will request a copy from the plan administrator. EBSA does maintain an extensive library of SPDs filed prior to 1997. Requests for those documents will be filled within 10 days, provided that EBSA has the document in its library. Requests for documents related to more than five plans may take more time to process. SPD requests that require contact with the plan to obtain a copy may take 30 to 60 days. All large special requests will be acknowledged within 5 working days. At that time, our staff will provide an estimated date for completion and will keep you apprised of any problems arising during the processing stage. All requests for documents submitted under the Freedom of Information Act will be filled or acknowledged within 20 days after receipt by the disclosure officer. All document requests will be processed on a first-come, first-served basis. We will inform requestors of any backlog.